"Yes, they have more money." 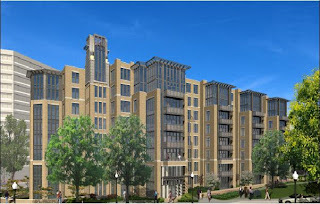 Ernest Hemingway, "Snows of Kilimanjaro"
107-unit condominium project located across Military Road from Chevy Chase Pavilion. The condos average 1,450 sq. ft. and range in price from $600,000 to $2.9 million. There is also six affordable units in the project, which was built on the former Friendship Heights' Washington Clinic site. 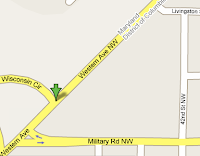 Built on a spit of land situated between Military Rd NW and Western Ave NW, the building is located near the best and most expensive shopping in the District. For you shoppers, imagine walking out the front door and finding the new Bloomingdale's just across the street! Neiman Marcus and Saks Fifth Avenue are close by, too. To paraphrase, if the mortgage doesn't kill you, the credit card bills will! It's not for nothing that the developer placed a photo of the Cartier logo on the condo's web site. Looking at the aggregate prices will help you understand why F. Scott Fitzgerald came to my mind... Condo fees average about $600/month, but those for penthouses will run about $1,000/month. Staggeringly, one fellow purchased four units for a total price of $5.5MM. He did try to flip one of them [unit #706] in late May for $1.721MM, a potential profit of $282,800, but the listing disappeared after a $122,900 price reduction in early June. I assume the listing was withdrawn. To date, no units have been flipped, but that's not for wont of trying. Aside from the fellow mentioned above, four units are currently listed for resale [see below]. DC6305121. Unit #212: this unit been on sale since late May. The price was reduced $58,000 to $1,129,000 within the last two weeks. DC6463392. Unit #104 [above]: this unit has been on sale since late May, too, but its MLS number just changed so now it's posted as "NEW THIS WEEK" on Realtor.com. A very small $6,000 price adjustment was made during the MLS switch. 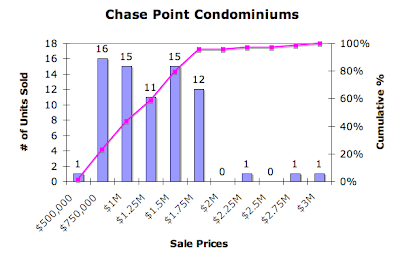 At this time, I find ten units listed on MLS, including the four in the table above. $2900: 2/1. $4000 if furnished. No unit numbers are provided. I'm hard pressed to believe these rents come anywhere near enough to cover the mortgage, but that's probably not a problem for these folks. Outrageous prices! The building is at a very noisy and polluted corner. Buses from the nearby station come and go all day long. I live in the area watched it being built and the prices rising from months to months. From $600k to $650k to $70k to $800...all the way to a million for 585 SF!!!! Being willing to be ripped off does not make you smart! BUT A BIG FOOL!